Dette er en workshop som gir barn anledning til å oppleve “kunsten å blande” i en åpen atmosfære hvor ingen av ingrediensene i blandingen skal være forutbestemt. Barn elsker å blande ting, og de gjør det hver eneste dag. De er generelt opplært til å blande sammen ingredienser eller objekter som til en viss grad er forutbestemt, at noen blandinger er “passende” mens andre er “upassende”, og for barna betyr det at det å blande har visse begrensninger eller betingelser. Workshopen vil komplimentere slike begrensninger ved å oppfordre barna til å utfordre sin egen kreativitet og gi dem full frihet til å blande alt de ønsker. Slik vil de blande ved å følge sine følelser og sin kreativitet uten å følge instruksjoner og uten å tenke på hva som passer eller ikke passer sammen. En workshop for barn av Mehdi Torkaman, Shiva Sherve og Ronak Moshtaghi. Barn elsker å blande ting, og de gjør det hver eneste dag. Barn er generelt opplært til å blande sammen ingredienser eller objekter som til en viss grad er forutbestemt, at noen blandinger er “passende” mens andre er “upassende”, og for barna betyr det at det å blande har visse begrensninger eller betingelser. Workshopen vil komplimentere slike begrensninger ved å oppfordre barna til å utfordre sin egen kreativitet og gi dem full frihet til å blande alt de ønsker. Slik vil de blande ved å følge sine følelser og sin kreativitet uten å følge instruksjoner og uten å tenke på hva som passer eller ikke passer sammen. Workshopen vil være inspirert av barna selv, og det forventede resultatet er at barna i høyere grad blir oppmerksomme på de utallige mulighetene som finnes når man blander, for eksempel farger og smaker, lyder og smaker, eller lukter og farger. Workshopen har blitt utviklet i samarbeid med Shiva Sherveh og Mehdi Torkaman. Children love to mix things. They do it every single day! 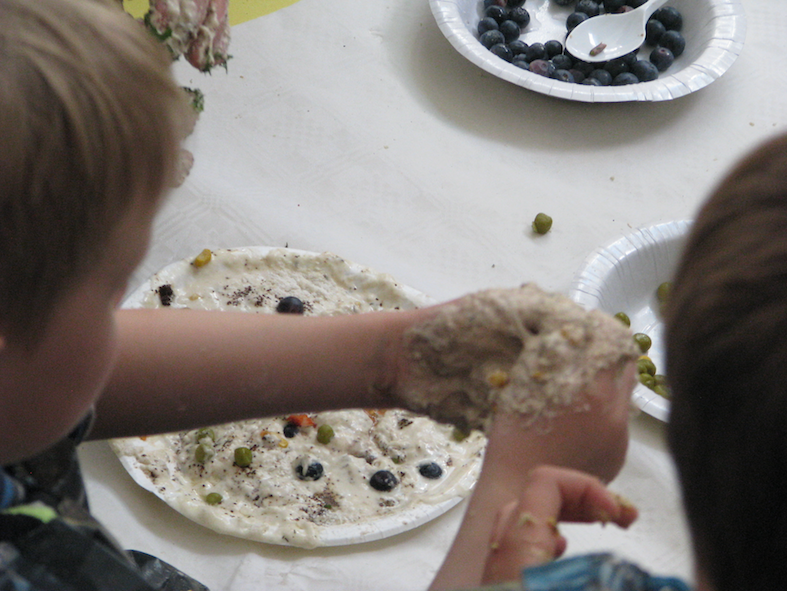 However, Children are taught to mix ingredients and objects that are to a great extent predetermined. They learn that certain mixtures are “appropriate” while others are “inappropriate” and come to understand that mixing has certain restrictions and conditions. This workshop will suspend such restrictions by encouraging children to challenge their own creativity and giving them full freedom to mix everything they wish. They can mix by following their emotions and creativity without following instructions and without thinking about what fits or does not fit together. 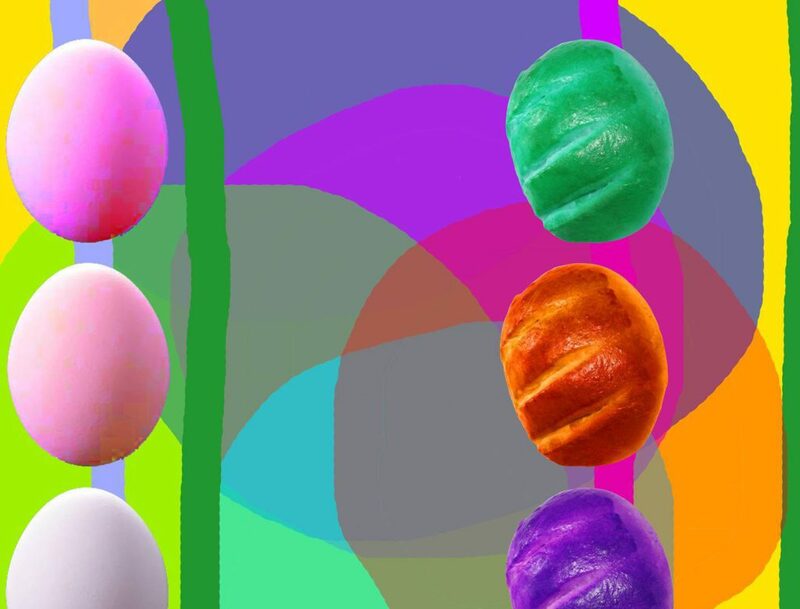 The workshop will be inspired by the children themselves, and the expected result is that children will to a higher degree become aware of the countless possibilities that exist when mixing, for example, mixing of colors and flavors, sounds and tastes, or smells and colors. The workshop has been developed in collaboration with Shiva Sherveh and Mehdi Torkaman. The space had been arranged into three separate but continues environments, with minimal decoration, no chairs, no tables, the gallery brightened by the sunlight shining in from the windows. We welcomed the people warmly, introducing ourselves as Mixer Artists, artists that like to mix things together to make new things. We said we truly believe that mixing is an art, which we want to share with our visitors today. A simple mix was chosen as the introduction, flour with water. 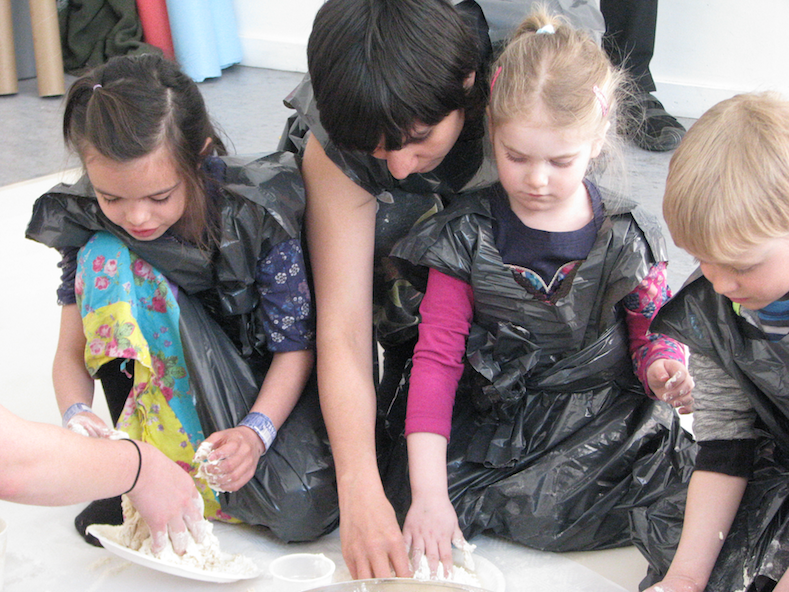 The children were asked to touch the flour and immerse in its softness, sometimes momentarily closing their eyes when asked. Next, a collection of ca. 10 smells, contained in bottles and bowls were provided for the children, curry, rosewater, vinegar, etc.. The task was to smell attentively, pick and choose different smells and add them onto the soft sticky mixture, putting the sense of touch and smell together. Every few minutes we would pick up our mixture, close our eyes, press it and smell it, conscious of how different smells fuse with one another. 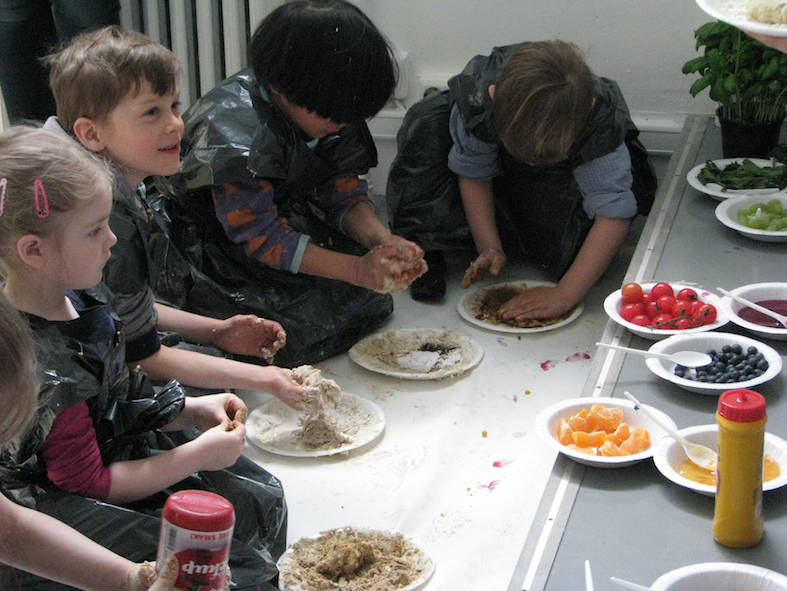 The children were asked, to bring their own mixture to the second space, where food items had been arranged like a color pallet, red edible items like strawberry and ketchup beside each other, white ones like sugar and yoghurt beside each other, and so forth. The task in this stage was to use different colors and make a beautiful painting on the surface of our mixtures. After a few minutes engaging in painting, we pointed out to the children that we can also try to taste different colors to see for example how red tastes like and how green tastes like. 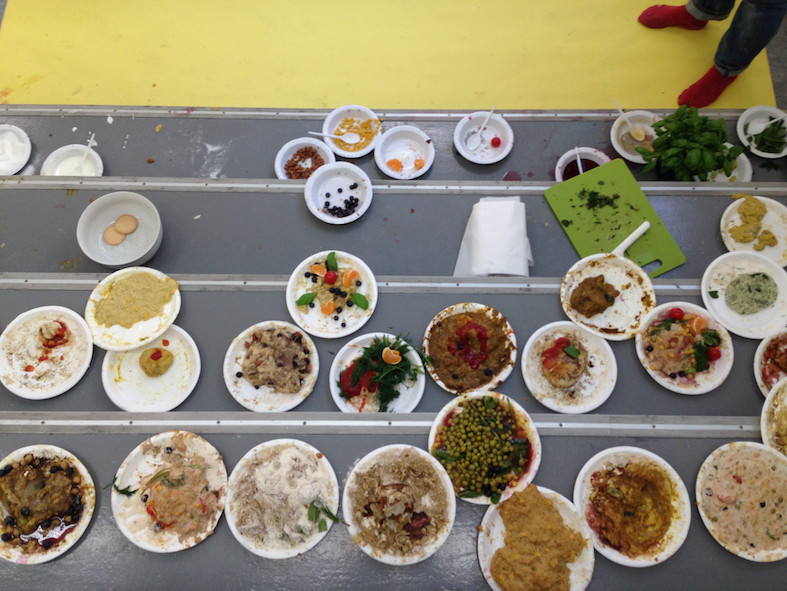 From this point on, we highlighted how the paintings that children were making could also be seen as taste paintings. This stage finished with us holding up each painting showing it around and praising it as a beautiful painting masterpiece. We tasted a bit of each before putting it on exhibition on the stairs, our exhibition of taste paintings. Mixtures were left on exhibition. Children quickly cleaned up and were invited into the third space, which was meant to be an ending, governed by a sense of meditation. Each child and those parents who were willing to take part were given a piece of banana. The children were asked to hold it in their hands, close their eyes and wait for us to tell them when to put it in their mouth. The Sound of the sea was played from the speakers and children started to eat. A calm voice suggested that they mix the taste of the banana with the sound of the waves, to listen with their tongue and taste with their ears. After around 30 seconds, everyone opened their eyes and we spoke together a bit about the experience and how it felt like. The children had different ideas. The task was repeated two more times, taste of strawberry with the sound of a traffic jam, taste of biscuits plus African music. The parents liked this experience as well. In the end we thanked everyone for coming, gave each child a carrot and gave them the task to chew on the carrot on their way home while trying to find different smells, sounds or colors to mix with the taste of carrot. Some of the children showed interest in taking their taste painting home with them. The workshop was carried out four times, each time lasting from 40 to 45 minutes. We would refresh the space for 15 minutes before opening the doors for the next round of drop-in visitors. There was an average of 7-10 children on each workshop, with various degrees of parent participation. The nature of the workshop was very inclusive and successfully attracted the children who ranged from 2 to 7 years old, from both sexes. The focus was to create an environment that allows children to engage in a simple and playful activity, aiming at deepening their senses and emphasizing on the freedom of mixing. In this regard, we ourselves see this workshop as a big success.